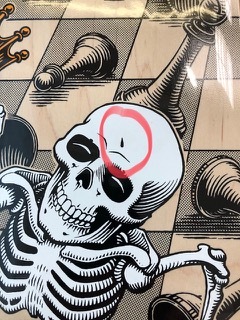 It was discovered that the Mullen 10 deck had an additional unique mark on the graphic. Our initial plan was to recall them and replace them. After some discussion we feel that many might like this ‘mis-print’ deck, maybe even more than the intended offering. So, instead of recalling them as planned, we are allowing our dealers to decide what they would like to do with them. They can sell them as a handmade, unique collectible piece, or they can send them back to us and receive a deck without the unique mark to offer. The screen has been fixed so future decks will not have this unique mark.